Design Miami 2015: islands of bronze rest on top of marble tables designed by Chilean studio GT2P for its first collaboration with New York's Friedman Benda gallery. "This project was born in an idea that was surrounding our studio about the tension between transcendence and tradition and how this idea could be articulated in the physical world," the studio's Guillermo Parada told Dezeen. "At the same time we were experimenting with some disparate materials to create structural collaborations between each other, and we found a perfect fit for this idea in marble and bronze," he added. It also designed a lamp which was encased in plastic that had been covered in alpaca hair woven into felt. 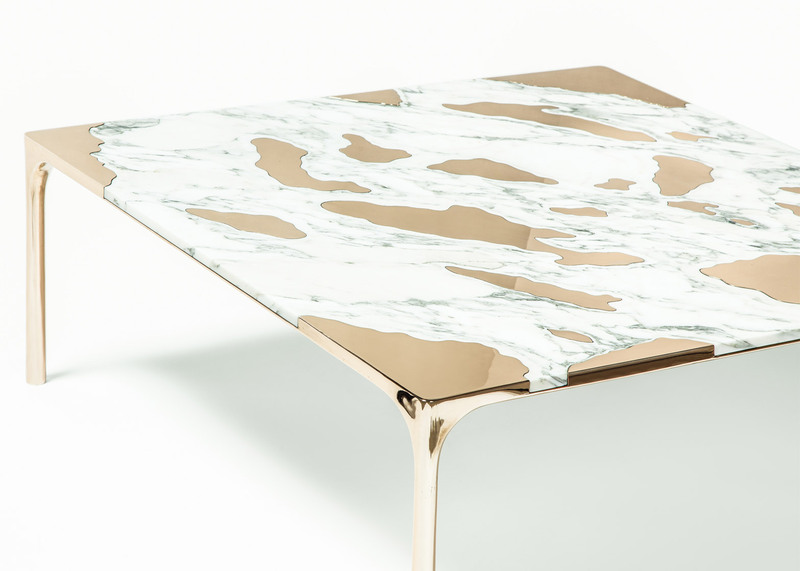 Marble has been enjoying a renaissance in contemporary design over the last two years. Dezeen examined the growing popularity of the material during the 2014 Milan design week, where designers including Zaha Hadid, Konstantin Grcic, Naoto Fukasawa, Jasper Morrison and Scholten & Baijings all debuted products in the material. Other studios that have used marble recently include Note Design, which created mixed-and-matched tables for furniture brand Menu, and Zaha Hadid Architects, which carved pleats into the surfaces of vases and tables made from different varieties of marble. The Marble vs Bronze coffee table is just one in a forthcoming collection of similar furniture by GT2P, which will include a dining table, shelving and benches. The table will be shown at Design Miami 2015, which runs from 1 to 6 December.